This is an Auto Drain Bowl – meaning any water accumulated in the bowl will be automatically drained when the air pressure drops below 18 psi. 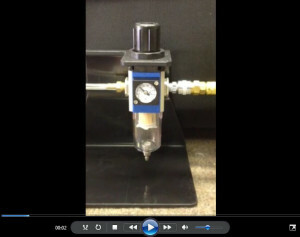 When you first start your compressor, there will be a brief draining until the pressure reaches about 18 psi. Every time the pressure drops below 18 psi, the water will automatically drain from the valve on the bottom of the bowl. When the pressure is above 18 psi, the water will not drain.